A place where business is done by a handshake, where folks still wave to one another and say “how are you?” and where newcomers are welcomed with open arms. We are a place where the hunting, fishing, and outdoors that make Louisiana a Sportsman’sParadise are close at hand in the richness of Franklin Parish. Winnsboro is a city in and the parish seat of Franklin Parish, Louisiana, and United States. The population was 21,263 at the 2000 census. Louisiana Highway 15 passes north-south through Winnsboro and extends northward to Rayville, the seat of neighboring Richland Parish. Franklin Parish is named for Benjamin Franklin. Franklin Parish was created on March 1, 1843, from portions of Ouachita, Catahoula, and Madison parishes through the efforts of Senator John Winn. The parish was named in honor of Benjamin Franklin. 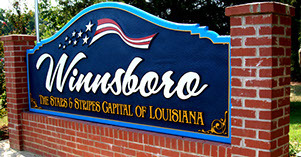 Land for a centrally located parish seat, Winnsborough (later Winnsboro), was purchased in 1844. It was designated as the parish seat of government in 1846 and Incorporated on March 18, 1902 during the administration of Governor William Wright Heard. The village of Winnsboro was incorporated in 1902, and Captain William Phillip Powell was appointed to serve as the first mayor. Early Winnsboro City records show that the telephone came to Winnsboro in 1905; electricity, in 1914; and water and sewer service, in 1923. In 1924, a volunteer fire department was formed. In 1938 a bond issue to build the present municipal building was approved, and the following year citizens agreed to the purchase of the Landis municipal park property. Most of the community’s streets were hard surfaced after 1950.